Overcoming Invisibility is a story about struggle, disability and empowerment. The story focuses on Kevin Pettit, 50, a courageous man who survived a near death car accident in 1998 in Minnesota. The accident left Pettit with a traumatic brain injury (TBI) that has affected him greatly. After many rough years of being physically and mentally disabled, having to re-learn how to walk, talk and eat again Pettit has come a long way in his journey. Despite the challenges Pettit faced early on, he kept moving forward. Now ten years later is where the story of Overcoming Invisibility begins. Pettit wanted to make a difference and is heavily involved in the community of disabled people, created an organization called Faith4All and wrote a book about his experience with TBI titled, Rambling Down Life’s Road…with a brain injury. Although Pettit overcame the physical challenges of the accident he still faces struggles as he carries on in his life. The TBI has affected Pettit’s mentality in many ways as he has memory loss, slight speech impairment and sometimes, unclear thoughts. Pettit’s story is empowering because he never gave up, continues to embrace his disability and strives to help other people with TBIs feel included in society and not invisible. Although his disability is invisible to most, Overcoming Invisibility strives to bring light to TBIs and what it is like to live with one. Double exposure of Kevin Pettit and rain on a window. This image symbolizes what Pettit said it feels like to have a traumatic brain injury. “It’s almost like your thoughts are all over the place and there is a puzzle but you can’t find the missing piece,” Pettit said. Kevin Pettit, 50, trims his beard in the bathroom of his house in Boulder, Colorado, on May 1, 2018. The writing on the mirror is notes that Pettit writes to himself so he can remember important things as he struggles greatly with his memory. Kevin Pettit, 50, stretches at the YMCA in Boulder, Colorado, on April 4, 2018. Pettit’s disability mainly affects him mentally, so physically he is able to do most of the activities that bring him joy, although some exercises are harder than they used to be. 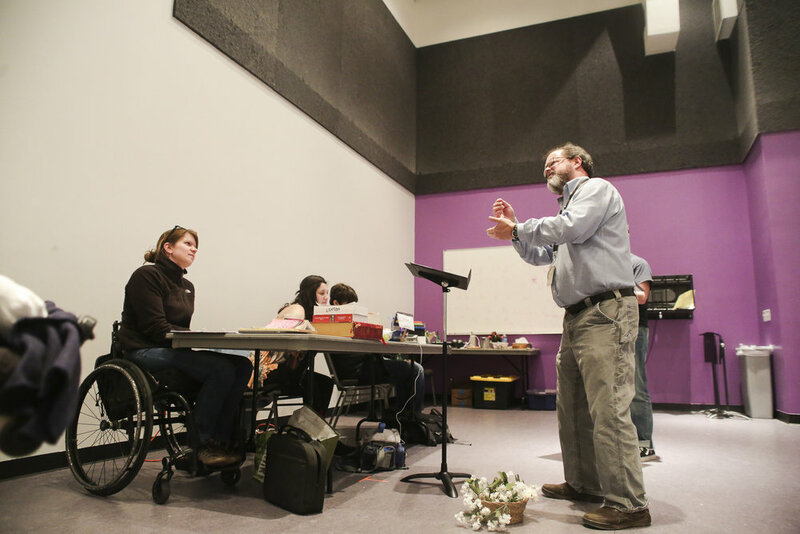 Kevin Pettit, 50, recites his lines during a rehearsal for the play of Romeo and Juliet, as Regan Linton, the director of the play, gives feedback to him at the Denver Arts Center on April 5, 2018. Pettit is an active participant in the Phamaly Theater group, which is a theater production company with people whom all have different kinds of disabilities. 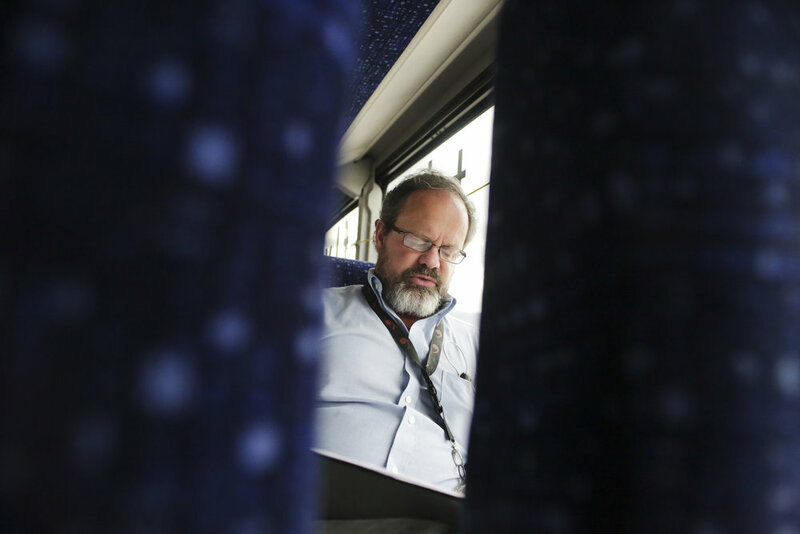 Kevin Pettit, 50, reviews his script for a Romeo and Juliet play on the bus ride to the Denver Arts Center on April 5, 2018. Ever since Pettit’s accident he has chosen not to drive again. Kevin Pettit, 50, rests his eyes as he lays in his bed in Boulder, Colorado, on April 10, 2018. Pettit sleeps with a breathing machine every night because after the car accident his airways were disrupted and he got sleep apnea. Wendy Zerin, a yoga instructor helps Kevin Pettit with a stretching exercise during a yoga class at the North Boulder Recreational Center, in Boulder, Colorado, on April 25, 2018. Everyone who attended this yoga class is apart of the program called Journey through Expand which provides recreation and leisure activities for adults with traumatic brain injuries. Kevin Pettit, 50, holds a doll he calls Mr. Spock, in his hands at the First Congressional Church in Boulder, Colorado, on April 24, 2018. Spock is important to Pettit because he sat by his bedside all throughout the time Pettit was in coma after his accident. Kevin Pettit, 50, laughs with girlfriend Mary Magee after choir rehearsal at the First Congressional Church in Boulder, Colorado, on April 26, 2018. Pettit and Magee both love singing and have been together for five years. Close up picture of Kevin Pettit’s scars at his house in Boulder, Colorado, on May 1, 2018. These scars are from surgery Pettit had to have because his pancreas and stomach was punctured and four of his ribs were broken due to the impact of the car crash. 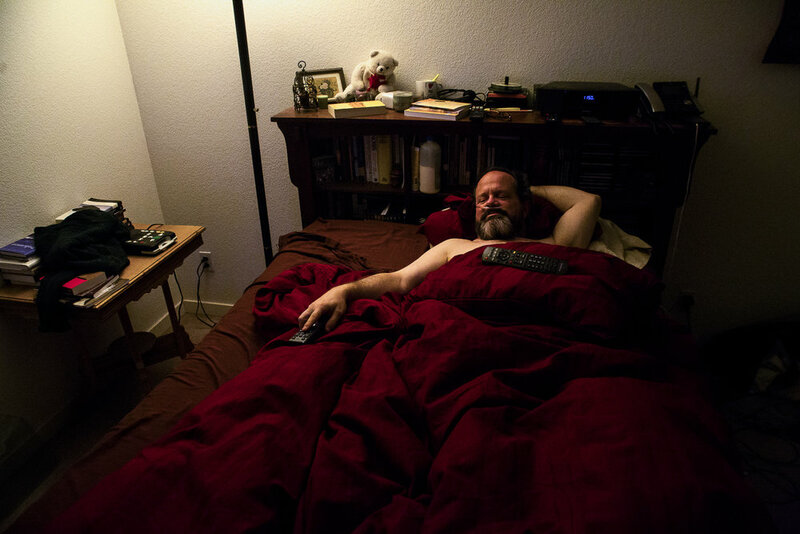 Kevin Pettit, 50, lies down and watches television before bed at his house in Boulder, Colorado, on April 10, 2018.